Grey would be the color of my life right now. But my nails shouldn't be. I need color, and more colors. So for my comeback nail art, I splashed (well, painted actually) colors on my nails and chose a bright color for base. I also changed the shape of my nails to round. I just needed something different. I actually liked it. I was able to grow my nails longer than I normally can with a squoval shape. Let's see how long I can maintain it. This is a freehand nail art accomplished using acrylic paints and nail art brushes. I wanted a design that is cheerful so I opted to use only bright colors. It's like letting the nails smile for you, right? I've gotten a lot of compliments while wearing this and as always, it is always a nice feeling to hear appreciation from other people. I used 2 coats of OPI I Just Can't Cope-acabana for the background color. Consistecy is great. Application? No problems there either. I also used a new set of acrylic paints from Born Pretty Store that I'll be reviewing thoroughly in a separate post. For now, let me say that I'm glad I have them. I chose 3 bright colors for the splashes -- blue, lime, and red. The splashes look like blabs really. Probably because I painted them "fat". A black outline would have looked great but I was contented with this. If you have more time in your hands when you decide to recreate this look, you can probably try outlining the splashes for a more dramatic effect. If you noticed, I also placed a few random white dots on the splashes for added details. I thought it could look like a light reflection or something to that effect. Regardless, it did make the nail design more interesting. You'll probably agree with me when I say that dots are the most reliable in nail art. My so-called new life allows me to have a more comfortable atmosphere. This means that I can now post more video nail art tutorials. Sometimes, it's not really the design that's important but learning how other nail artists paint their nails that really matter. I, myself continue to watch tutorials of fellow artists to learn new techniques. Hopefully, I can contribute to this learning process. Thank you for reading, and for watching the tutorial! 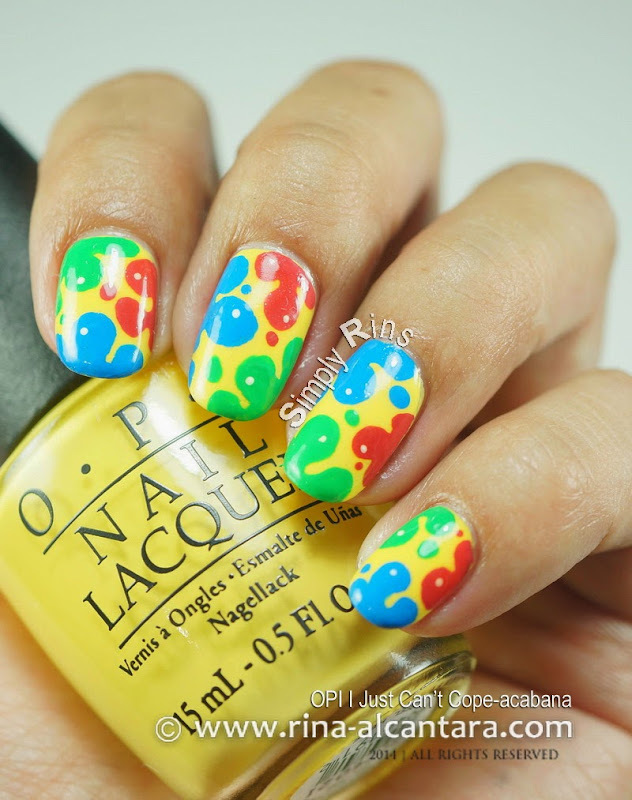 What do you think of this colorful nail art design? If you'd like a sneak peek on the acrylic paints and set of nail art brushes that I used, please follow this link. This looks like a really nice set of paints and brushes. I might be getting this since I recently ran out of nail paint and the brush I had broke.